For over 50,000 years, Australia’s Indigenous community cared for country by using land management that worked with the environment. Using traditional burning, fishing traps, and sowing and storing plants, they were able to create a system that was sustainable and supplied them with the food they needed. When Europeans arrived, they brought farming practices suited to an environment very different to Australia, that in the long-term caused erosion and salinity. While many historical European accounts of Indigenous land management have faded, today there is a shift to recognise that Indigenous people had sophisticated sustainable agricultural systems. There is growing adoption of these practices to repair the damage done by European farming. One example gaining traction is the use of traditional Aboriginal fire management. Indigenous land management included using fire to regenerate flora. Indigenous communities used fire across Australia, and in some areas this created expansive grassland on good soils that in turn encouraged kangaroos to come and were later hunted for food. Historians and researchers believe selecting what areas to burn, when, and how often, was part of Indigenous knowledge of the land. The result was a mosaic of trees and grasslands that meant the highly combustible Eucalyptus forests were not likely to create intense bushfires. With the arrival of Europeans, much of this practice has given way as fire became feared rather than harnessed as a tool to manage the scrub. The result was the grass plains gave way to thick scrub and bushland that was prone to intense bushfires. Australian National University professor Bill Gammage, an expert of traditional Aboriginal burning, told Landcare in Focus the use of fire could be adopted across the country and used for a variety of land management problems. “Fire can be used for one of three outcomes. 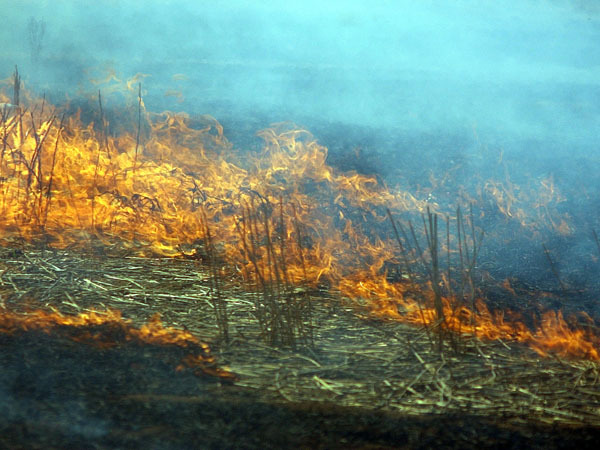 The first, to encourage native grasses to regenerate and produce new feed, the second to reduce scrub and fuel to prevent intense bushfires, and thirdly to promote biodiversity,” Bill said. It is already in extensive use across the country, but particularly in the north where native grasses grow more vigorously in summer and need to be controlled, and where Indigenous communities actively manage the land. “On public land, national parks and public reserves and larger pastoral land it could be applied very effectively,” Bill explained. “Aboriginal people would apply it to very small areas if necessary, like back burning along creek front or pushing back bush in grassland,” says Bill Gammage. The adoption of traditional Aboriginal burning requires a sound understanding of local conditions to ensure it is effective and safe. “Local conditions, climate, plants, and animals, all matter and have to be taken into consideration,” Bill explained when considering the fire stick farming. He also said land managers need to understand how plants relate to fire and that this was local knowledge. The type and timing of fire was dependent on the season and location. This was important, particularly in the north where grasses dry out and a fire would be uncontrollable. Bill said fire was used at a time following the wet season while the grasses and soil was still damp. Across Australia there are a number of groups that work with farmers and Indigenous people and encourage them to work together to share knowledge and manage the land. Some of these groups include Local Land Management, the Aboriginal Land Management Councils, and Landcare groups. These groups encourage farmers and Indigenous people to work together to adopt land management practices closer to those used by Australia’s first inhabitants. While the use of fire is not the only tool, it is one the Indigenous community can share.